Rags Designs Ltd are a clothing manufacturing company based in Leicester who have been producing garments for over 10 years. As part of KTL’s delivery within the Interserve Learning and Employment programme (part of the Skills Support for the Workforce project) which is funded by the ESF we are pleased to showcase the latest achievers from Rags Designs. The latest learners rolling of the qualification production line within Rags Designs has seen a further 6 individuals complete their Level 2 NVQ in Manufacturing Textile Products. This now makes a total of 18 members of staff with Rags Designs who have successfully completed this qualification. 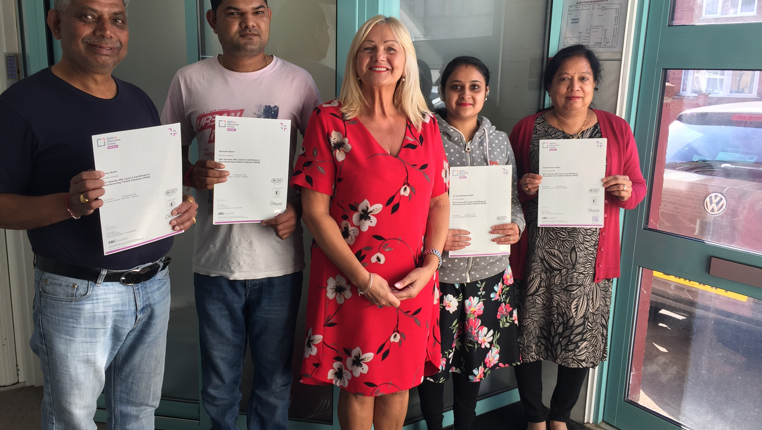 Sunny Parmar, Director of Rags Designs Ltd said “Having the NVQ training has not only given the workforce a qualification, but also boosted their confidence and motivation, this has helped to show they are skilled and valued by our company”. KTL as a specialist provider of training and education to the fashion, textiles and apparel sector pride ourselves on developing the workforce and supporting the industry to achieve it’s goals. Bev Rowe, Tutor/Assessor of KTL Ltd commented “Each visit I could see they were more motivated and confident. They were proud to show their evidence and what they had learnt. They were working more as a team, helping each other when needed and exchanging ideas for improving their work”. Pictured is 4 of the recent achievers from Rags Designs Ltd together with Tutor/Assessor Bev Rowe.